Wow, this blogger page is still here! Most of the posts here are very old. But new content is being posted daily at the new Langa.Com. Stop on by! Boston Habah 180 panorama under pre-Jose skies. Right to left: Boston Navy Yard, the Bunker Hill Monument, the Cassin Young, the USS Constitution, the Museum of Science Zakim Bridge, TD Garden, the North End, the Coast Guard station, the financial district, the Customs House Tower, the harbor proper with the seaport district in the background; on the far left, East Boston. 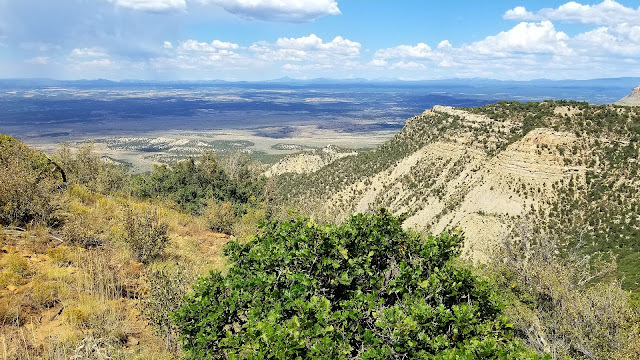 I recently traveled to Wyoming for the eclipse (very nice; we had a great clear-sky viewing location in the high desert, virtually dead center in the totality band, far from any crowds). 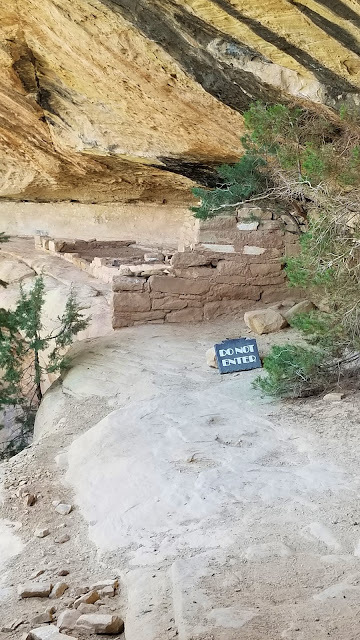 It's also interesting for its geology and long history of human habitation by the Anasazi Pueblo peoples, who built their houses beneath the shelter of the mesa's many rock overhangs. I'd been to Mesa Verde before, but had never hiked to Petroglyph Point; a somewhat hard-to-reach spot where the Anasazi people --- shamans? people on dream quests? artists? 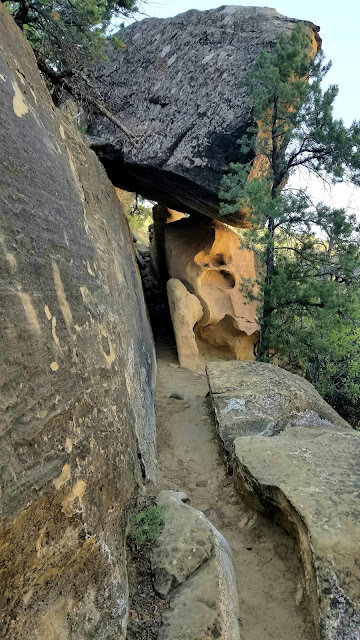 --- used rock tools to inscribe their origin myth on the exposed rocks of the mesa; painstakingly chipping away the desert varnish (https://en.wikipedia.org/wiki/Desert_varnish ) to expose lighter-colored rock below. 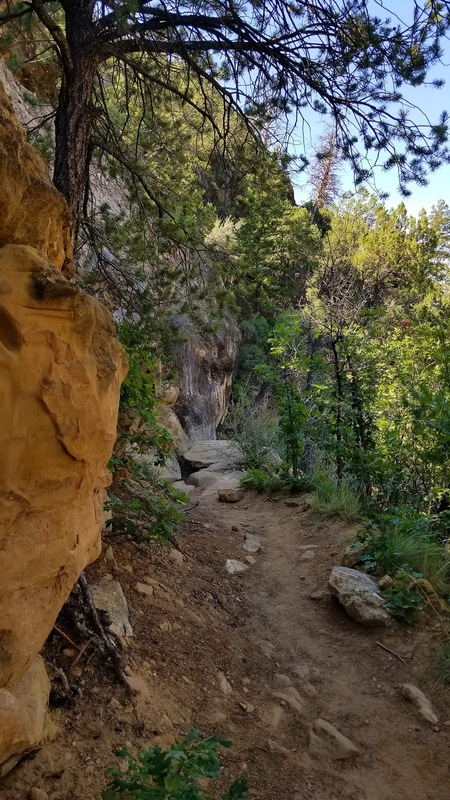 The glyphs are about halfway along a three mile (5k) loop, of which the first half is rocky, steep (about a 750'/225m total climb), narrow, precipitous, and with poor footing in spots. 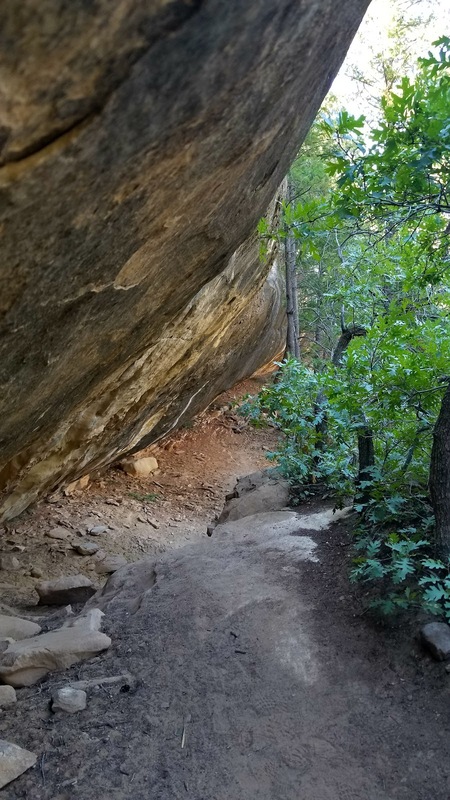 Sections of the trail use rock slabs as steps; in other places, foot- and handholds are chipped into the rock. You need to walk carefully. But the views are very nice. 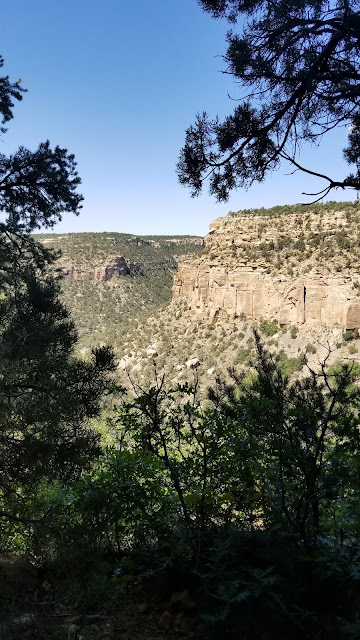 There are some small pueblo ruins along the way. Then, after a while, you arrive at the glyphs. 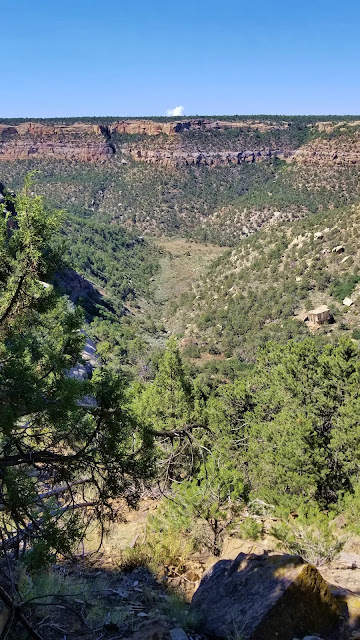 They emerged from a sipapu (right side of the image) --- a spirit portal in the Grand Canyon --- and wandered the desert for a long time, with various clans splitting off along the way, until they arrived at Mesa Verde (left side of image). 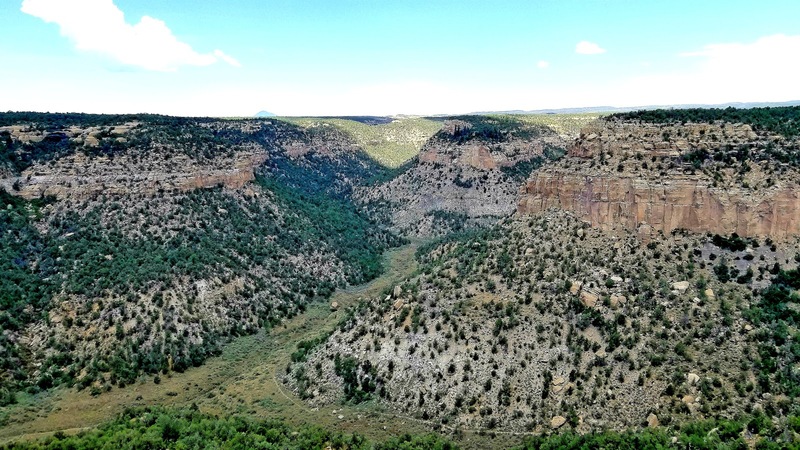 A = the Grand Canyon/Sipapu, where the Anasazi emerged from the earth into the world. 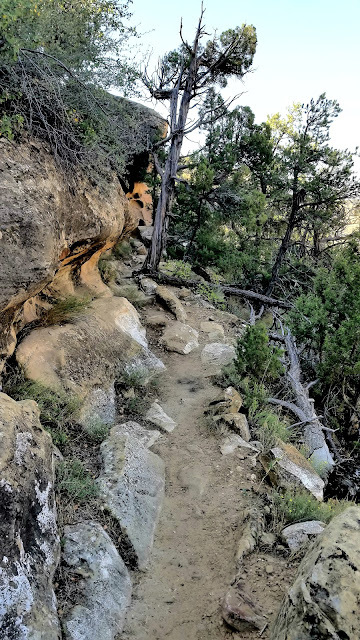 E = either the Horned Toad Clan splits off; and/or a symbol of the "lizard spirit" who led the Anasazi through aimless wanderings "almost approaching lunacy" for a long time (the linear trail stops, and doubles back and spirals on itself). I = another "whipping kachina" driving Anasazi men, women, and children (J). The handprints are various artists signing their work; or perhaps others simply saying "I was here." It's a very nice spot, and worth the effort, if you have a couple hours to spare while you're at Mesa Verde. A 2017-08-02 bike ride along the Charlestown Harborwalk led to a pleasant surprise; I got to see an unpublicized move by the 223-year-old USS Constitution. The move also required that the Cassin Young, a WW2 destroyer on display in the Navy Yard, also be moved. "Trump wants you to focus on Sessions, Clinton, and Scaramucci this week. You need to focus on health care, health care, and health care."